1 pcs Stainless Steel Pan Pot Cover Lid Rack Stand Spoon Rest Stove Organizer Storage Soup Spoon Rests Kitchen Tool Description Material: Stainless Steel Size:18.5cm x 21cm / 7.3'' x 8.3'' Color: sliver Package Include: 1 Pan Pot Cover Lid holder. Features: high quality durable stainless steel, Designed specially for Home Kitchen & Bar. Easy to clean and it is great gift for housewife. It can offer a new place to your everyday lid rest. Ideal for holding your cooking spoon & hot pot lids. Fashion design and convenient to carry and clean. 100% brand new and high quality with competitive price. Can be placed any size, spoon, spatula and help to keep the environment clean. Best Price, Best Quality, Save your Money. 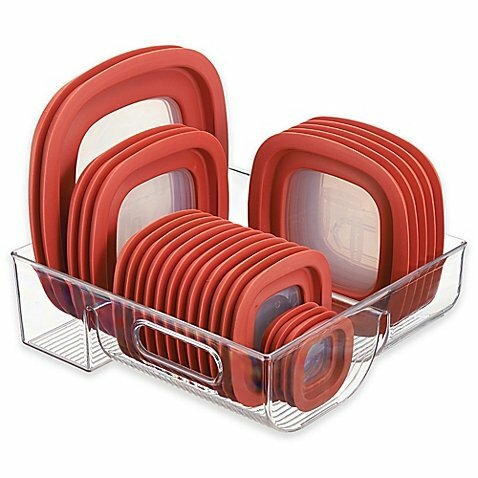 Place the Cabinet Binz Lid Organizer by InterDesign inside cabinet to keep lids for pots, pans and food containers neat and easy to find. With 3 compartments to fit lids of various sizes, the plastic organizer can be cleaned with a damp cloth. Perfect for putting pot cover, lid. Made from durable PP material and nice design. Suits for Kitchen, restarant,hotel and all kinds of party. Finally! This pan organizer if a triumph over the messy kitchen cookware. Making the most of your available kitchen space is now easier than ever thanks to our smart kitchen storage device. This is a multifunctional and versatile lid, platter, pot and pan organizer customizable to your storage needs. Now 5 + pans or pots can be easily and securely stored in your kitchen: in the cabinet, cupboards or on the countertop which allows you to optimize your kitchen space and make the most out of every single inch. Our lid organizer consists of a basis and 4 dividers. 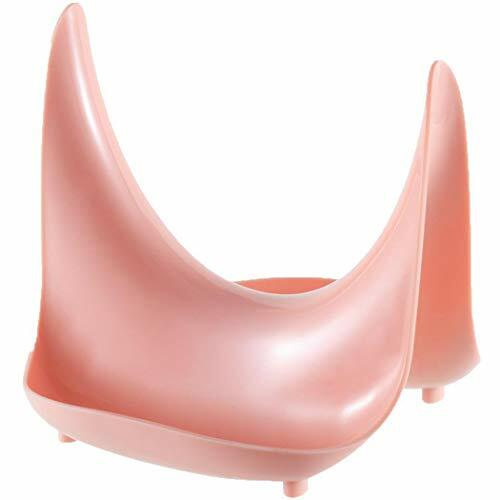 The base is made of premium quality durable ABS plastic. 4 strong dividers of the pans organizer are stainless steel and have different sizes. The heaviest items shall be stored on the lowest levels of the pan organizer (the pyramid method - the heavy items go closer to the bottom of the organizer). Set-up takes 1 minute, no tools required, so keeping kitchen area organized is achievable for everyone. Simply insert the divider of chosen size into a specific port in the base. No pop out guaranteed. Easily works with any size of pans, lids or platters. Thanks to the adjustable dividers, all sorts of crockery can fit our pan organizer: frying pans, casserole pots, woks and others. In addition, the dividers of the pan organizer have lid holder to securely store your lids, making this device also a lid organizer. This is a safe, convenient and super reliable way of storing your kitchen tools. Keep your space much more clear from clutter no matter what size your kitchen is! 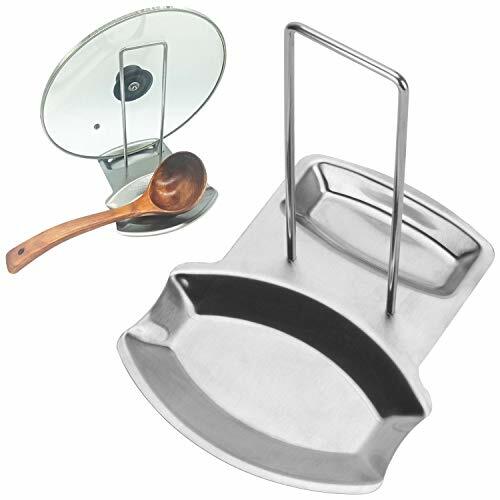 ADJUSTABLE: our pot and pan organizer has strong stainless steel dividers of 4 sizes. Adjust the pans organizer rack by inserting the divider of chosen size into specific port on the plastic basis. Dividers of rack pan organizer fit securely into the base. The heavier item you store - the bigger divider of pot rack organizer you take. Heavy items shall be stored in the lower compartments of pan organizer. TOP FUNCTIONALITY: the pot lid holder is easy-to-clean and the dividers are rust-proof. Our pan lid holder compactly and safely stores your kitchen items, dividers will not pop out and leave no scratches. 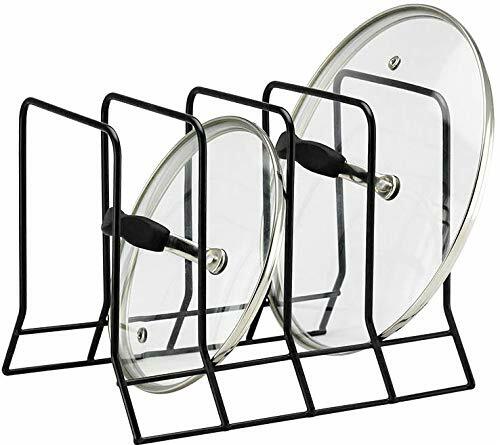 The pots pans organizer is a universal tool and can be used not only as a pots organizer or a pans holder but as a kitchen organizer for various things. Special form of the dividers allows to hold the lids firmly. 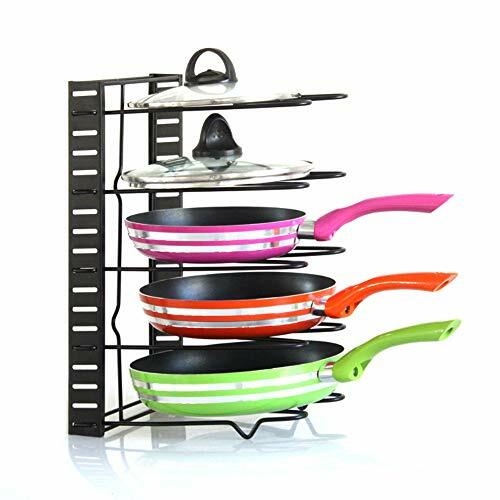 DURABLE: our frying pan organizer rack has a durable and long living basis made of premium ABS plastic. The basis of pot pan organizer is wide enough to suit any size of kitchenware. 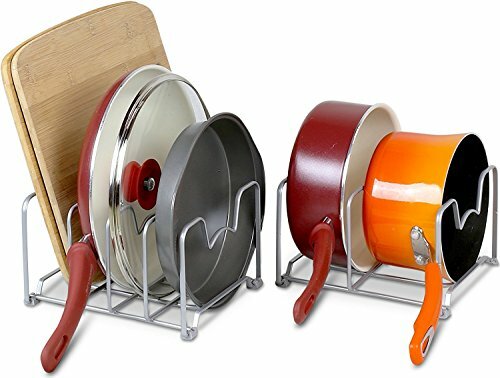 This lid organizer for pots and pans can easily hold a heavy pan, lid, pot or cutting board. PERFECT SIZE: 9.2'' (L) x 8.5'' (W) x 17.7'' (H). One minute set-up, no tools required. 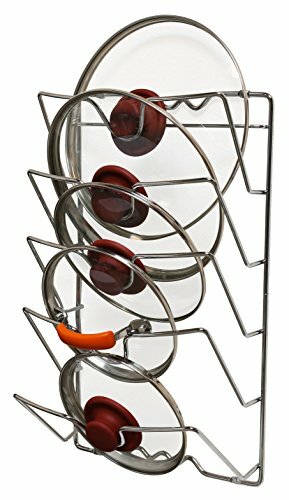 The pan rack organizer easily fits any drawers, cabinet or pantry. The pots and pans organizer does not occupy much space and can also be placed on the countertop space to keep your kitchen stuff upright and easy to find. The multi tiers storage rack is a good choice to organize pot, pan, pot lid in order, helping to maximum storage space and make your kitchen looks clean and tidy. 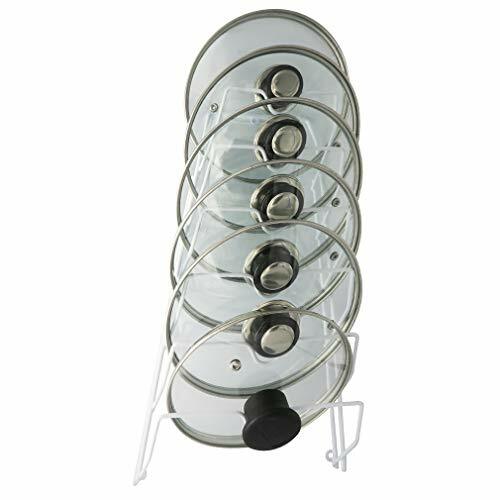 It can put up to five pans vertically or four pans horizontally. The entire organizer is 15 long. The height between two tiers is adjustable according to the thickness of pan. You can put the storage rack at the kitchen countertop, cabinet or cupboard to maximum storage space. Two directions to place: This pot rack could be placed horizontally or vertically according to your needs. Made by heavy duty iron, not easy to tilt or bend, durable for a long time use, more durable and holds heavy weight cookware without shape change. Premium black coating provides a 100% rustproof and makes it easy to clean. The pan pot rack comes with everything required for the assembly if you need it. No tools are necessary and comprehensive instructions are included, allowing you can be set up in under a minute! Free Standing and space saving. Our organizing rack can be free standing or mounted in your cabinets. Optional mounting hardware is included. 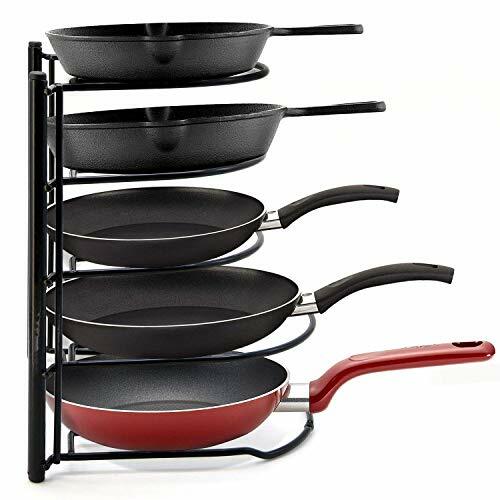 Each tier is 2.4 inch and made of sturdy metal, giving you the ability to store pans and cast iron. Easy to clean and protects pans from scratching each other. Can be used vertically or horizontally in your Kitchen cabinets or on your counter top. Always easy to reach and see, giving you a clutter orderly and efficient kitchen organization system. SOLID CONSTRUCTION- Constructed from cast iron, durable and stable enough to store up pans of different sizes. LARGE STORAGE- The ingenious design provides you store up 5 frying pans which saves more space for your kitchen. 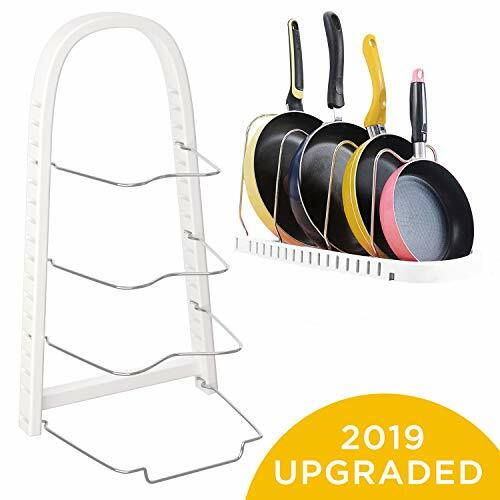 EASY TO USE- This pans rack organizer can be placed vertically and horizonally based on your needs. ADJUSTABLE- The space between tiers gives you more options to choose pots of different size, and you can place cookware quickly. GOOD PROTECTION- Solid cover could be protect pans from damage and scratch when being place into.